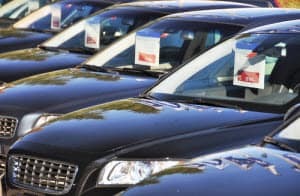 Are you looking for a used car dealership in the Indianapolis, IN, area? There’s certainly more than a few to choose from. However, we here at Andy Mohr Toyota feel confident that few dealerships can match us in either selection or in customer service. When most tourists talk about visiting Indianapolis, they’re probably thinking about the Motor Speedway or the Children’s Museum. Both are wonderfully famous attractions. However, locals know this city has so much more to offer than that. When our team takes the trip into Indianapolis, we’re usually visiting those lesser known sights. We’ll head to the Market Street Catacombs or to the Indianapolis Moon Tree. By visiting these rarer gems, you get a much better sense of what Indianapolis has to offer. Now, do you want to get better acquainted with what our Indianapolis area used car dealer has to offer, too? All you have to do is read on. Shop Used CarsOne of the goals of our used car dealership is to really streamline the car buying process for all Indianapolis, IN, drivers. That means total ease, from start to finish. Just take finding a car, for instance. The best place to start is right here on our website, where you can view our full selection of used cars. We have a wide variety of models in stock. Cars, trucks, SUVs, minivans—whatever your lifestyle demands, we can match it. If you’re looking for a car with a bit of extra protection, you can check out our selection of certified pre-owned cars, too. These have all been thoroughly inspected and refurbished to ensure you get a like-new car. When you come into the dealership, you’ll have a few different team members at your side, ready to make your experience as satisfying as possible. Sales representatives: These are the people that will help to match you with the used car that best fits with your needs. Finance professionals: Need help securing a loan for your car? Fil out a finance application here on our website, and our financers will take care of the rest of the work for you. Service technicians: The service center at our used car dealership is happy to care for all Indianapolis, IN, vehicles. From services like oil changes and tire rotations, we have you covered. With their help, your used car can last for many more years and many more miles. When you have a question during the car-buying process, don’t hesitate to ask any one of these professionals for their advice or expertise. They’ll make sure that you drive home with the right car and the right financing terms for your needs. 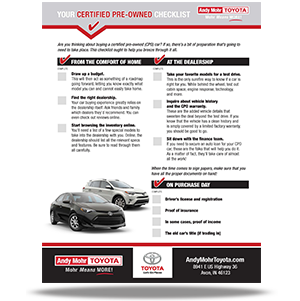 At Andy Mohr Toyota, we can’t tell you what car to choose or what features you’ll like best. However, we can tell you that we have something that you’ll love at our used car dealership near Indianapolis, IN. If you’ve checked our inventory and see a model that you like, get behind the wheel. Schedule your test drive today!